Soccer baseball is played on a baseball diamond and follows most of the rules of baseball. 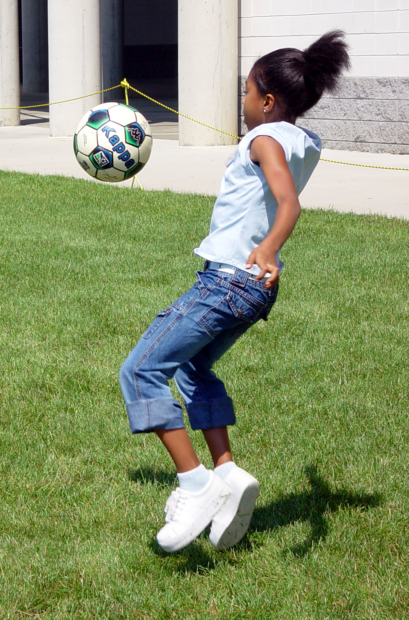 However, instead of using a baseball & bat, you use a soccer ball (or kickable rubber ball of a similar size). Divide the players into teams. One team will take the field & one will ‘bat’. In other words, one team will place its players on the 1st, 2nd, and 3rd bases, appoint a pitcher, catcher, and have outfielders (left, right, center). If you have enough players you can also have a short stop and a rover for outfield. The other team makes a batting line up that they can use to give everyone a chance to come up to bat. The pitcher rolls the ball towards the batter. The batter kicks the ball and starts running the bases. Fielders try to catch the ball and get it to the bases to get the players out. When 3 batters are out, teams switch and batters go into the field and the other team comes in to bat. You can play 5, 7 or 9 innings, and the team with the highest score (runs in) wins. Since it is pretty hard to strike someone out in soccer baseball, you will usually set a maximum number of pitches per batter. Foul lines still count – like in baseball – and the player needs to bat again (provided they have not used up all their pitches). It is up to you whether stealing bases is allowed. Just make sure everyone knows all the rules before you start.